400X Flow Control Valve - Shanghai Taitong Valve Co., Ltd. The valve limits the flow rate in the pipeline to a preset rate, regardless of upstream pressure variations. 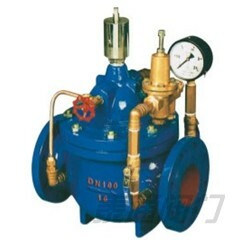 The valve is controlled by pilot valve, which takes use of integrated orifice plate to detect flow rate represented by differential pressure, and the differential pressure is used to control the pilot valve to implement flow rate control.